Why would one disk defragmenting program take so much more time than another? Disk defragmenting can take minutes or hours; I'll look at why that might be and what I recommend for regular defragmenting. My question pertains to disk defragmenting programs. I'm not having any issues, but I would appreciate a little clarification on how one may differ from another and their effectiveness, if any. I have Windows Vista 32-bit W/SP2 installed. I have a 320GB hard drive that's three months old and the OS was a fresh install also at that time. I'm currently using 55GB and 10GB of that are allotted for system restore points. I have two defrag utilities currently installed and I am thinking of purchasing one of them. I don't use Windows defragger at all. As a rule, I try to not let the disk get above 10-15% fragmented. I defrag about once a week for now. One of the programs never takes less than 45 minutes to do a normal defrag and the other never takes more than 10 minutes to complete the task. How effective or thorough can a program be if it's finished before you can blink an eye? And is this a fair assessment of how good a utility is, by how fast it can complete the task? They all say that they're the best thing since sliced bread and lightening fast, but I have to wonder if quality is being sacrificed for speed. I would appreciate an objective opinion if you have one on this subject. I'll start by saying that disk defragmenting is highly overrated. I'm not saying it's unimportant. It is important. I am saying that it's just not as important as many people make it out to be. Let's look at disk defragging, why one program might take hours while another might take minutes, and what we might infer from the difference. If you've ever had your newspaper get spread out all over your yard in the wind and then had to go out, pick it all up, and put it back together in order, you're familiar with defragmenting. Over time, the same thing happens to the files on your hard disk. Individual pieces of the files get spread out all over the surface of the disk so that when the file is actually used, the hard disk must physically move the read/write head all over the place to access the individual pieces. Kind of like walking around your yard to read the paper, but leaving all of the pages where they landed. Defragmenting moves all of the pieces of files together in order, so that they're easier and quicker for the disk to access when needed. That's somewhat like walking around your yard once to collect the pieces of newspaper together and putting them back together in order. Now reading the paper is simply a matter of starting at the beginning and turning pages. Typically, a defragger that runs quickly focuses exclusively on exactly that: collecting files and putting them in order. And it might not complete the job. What you might find after running a defragmenting program that completes quickly is that there are still some files left in a fragmented state. Somewhat like asking your teenager to pick up the newspaper - it might do the parts that are easy and pick them up quickly, but it leaves a few "less important" sections where they were. The result is definitely an improvement, particularly if the commonly used files are defragmented, but it's not complete. A more time-consuming defragmenter might well be much more thorough, making sure that each and every file that can be defragmented is completely defragmented. Depending on how much free space there is on your drive, that can actually take a fair amount of additional time. On top of that, while not technically defragmenting, some tools perform an additional optimization and move all of the defragmented files on the disk to the same area of the disk. That's somewhat like bringing in all of the newspapers into the kitchen after collecting and reconstructing them in order. Not only are the newspapers easier to read, but they're all collected in the same place in the house and thus easier to locate when needed. Collecting all of the files together like that can take additional time. While a perfectly defragmented disk sounds desirable, you're actually not likely to notice much of a speed improvement compared to a disk where only most of the files have been defragmented. As a result, it just may not be worth it to perform regular, lengthy defragmenting. A simple periodic defrag might be more than enough to get you the speed benefit that you're looking for. The one exception that I find myself making to this is after installing Windows. There's so much file activity during the installation process to files that are a) never written to again and b) read frequently as part of Windows' own operation that a thorough defragging can make sense to put those files in their most optimal positions. After that, periodic and quick is good enough. Windows' own built-in defragmenting tool is easy enough for periodic defragging. In fact, if you're running Windows 7, you don't need to do a thing: Windows 7 schedules a weekly defrag of all of its volumes by default. You can set up your own scheduled defrag in previous versions. There are many, many third-party defragmenting tools available if you want a more thorough scan. Of late, I've been using Piriform's Defraggler for the task. As an alternative to a third-party tool, you can also run the Windows tool repeatedly until it shows no or a low number of fragmented files. I'll repeat what I said above: a lot of extra effort in defragmenting your hard disk isn't going to result in a noticeable speed increase. Consider a thorough defrag after you set up your machine or maybe every year or two thereafter. Then, set up an automated weekly defrag and move on to other things. † This does not apply to solid state drives, such as SSDs and Flash drives. Because there is no physical disk head to move, defragmenting has no effect on performance of these at all, and as flash memory wears out, defragging solid state media can seriously shorten its lifespan. How often should I defragment my hard disk? 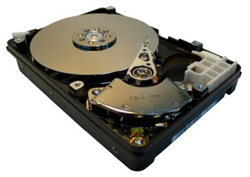 Periodically defragmenting a hard drive can significantly improve its performance. I'll review how often makes sense and when you shouldn't. Should I defragment my USB Flash drive? We've all been told that defragmenting a hard disk is a good thing for performance, but the same is most definitely not true for flash drives. I've got Windows 7 (64-bit) and a solid state drive. Is W7 smart enough to know NOT to do the weekly defrag you describe in the article? If not, is there some way to turn it off? I believe that it is, yes. Great explanation Leo. I love the scattered newspaper analogy! You do a great job of explaining things in layman's terms so the non-techie can understand the concepts. On my computer, the hard drive tends to be on the loud side (just the normal grinding/chattering noises, nothing faulty) and I noticed it gets noisier as the drive gets more fragmented. So I defrag not because it speeds things up but because of the noise. On another of your comments - there are enough free defrag utitities (I use My Defrag, but there are many more) that you shouldn't really need to buy one. I'm not an enthusiastic defragger, but I do find loading some programs a bit slow, which is why I would endorse the Piriform Defraggler (apart from the fact that it's free) - it will happily defrag specific files, which is a lot quicker than defragging a multi-GB drive. After all, who cares if files that are only loaded occasionally are fragmented. Though the reason that some programs are slow (e.g. Firefox, LibreOffice, Gimp) are that there are so many files to be loaded before the program's ready to do anything at all. In my perhaps naive opinion, the key here is "frequently used files". I had no defragged this laptop since purchasing two years ago. I booted clean and tested the performance with a reputable diagnostic program, then defragged, rebooted, and tested again. Zero difference in performance. I think this is because the defragging would have only helped on files that were often used over and over, but I have very few of those. I use Auslogics defragger every now and again. Seems to be one of the better ones. Did have a bad experience when trying out Smart Defrag from Iobit, the Advanced System Care people. Not sure what went wrong but I tried it on two of my many back-up drives and it appeared to hose the file systems and/or caused disk errors. "Lost" several thousand music tracks, although the used space on the disks was still the same, so I reasoned they must still be there. After running CHKDSK, they all re-appeared, so I'm now more than a little wary of de-frag programs after that! A good job, methinks, that I'm a bit paranoid about back-ups, having multiple drives to do the job. Love the newspaper explanation. I use messed up file cabinet..putting all the associated files together. Also I use idea of two index sheets of files to explain check disk. I worked in radio where we would add and delete files a lot daily. If you do this type of activity, defragging weekly does speed things up greatly. I have been using nothing but Advanced System Care suite for years now, which comes with "Smart Defrag " I have never had a problem with it. But I would never use a defragmenter for a backup drive. It just seems like it would be a really bad idea to move files around on a system backup. Smart Defrag has a feature called optimize which moves things that you access most often to the outside of the hard drive platters. The outside of the disk is traveling across the laser much faster than the inside portion of the disks. which means faster data access. I do this after installing Windows and all my programs. After the first time I just do an occasional regular defrag. It just seems like it would be better to start out with everything in good order, for long term speed and zippyness. I don't see how the guy who wrote you gets his hard disk 10 to 15 percent fragmented. I didn't think that was possible, I have never even seen 5%. I have maybe seen 3 or4% at the most on really old neglected installs. I usually see way less than 1%. I leave ASC running full time for automated cleanup and optimization. It does its thing while system is idle. My task manager shows it using 176 KB, on a Thinkpad with Hyperthreading and 4 gigs of ram. It is also good for people who won't maintain their systems. I think a clean and defraged system stays running good consistently and longer. But I definitely don't see the point in buying programs to defrag and clean your disk. If someones system is that bad it's not going to fix it. I have a Mac now though, does one still need to drag? Spinrite does not defrag. I also run it regularly. It actually has no idea about filesystems and what files are on the disk. Spinrite is all about maintaining and repairing data on magnetic media. I too defrag occasionally - primarily just prior to performing a system backup using Acronis. I have been using My Defrag (http://www.mydefrag.com/ - J. C. Kessels) and it is "freeware". There are several defrag options, as well as, command-line options. You may want to check it out. Keep up the good work. And let's remember that Solid State Drives (SSD) should not be on a defrag schedule. I get so tired of reading tech articles on a daily basis during my troubleshooting and picking through all the tech jargon. The one I hate the most is the acronyms, most of which don't need to be an acronym but the writer just wanted to flex his I'm-a-smart-and-proud-techie muscle so he used them anyway....grrr. Thanks for the excellent articles Leo. 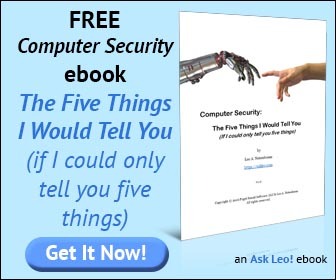 Leo, you used to recommend Diskeeper Pro. I use Vista 64 and Win 7 64, do you recommend against using Diskeeper with those OS? I've never recommended Diskkeeper Pro - I've never used it myself so have no data on which to recommend or not. So sorry, I mistook a comment which mentioned Diskeeper for one of your postings, my mistake. PS: 3 physical hard disks, not 3 partitions on one hard disk. 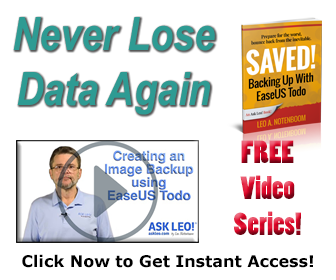 Leo-I use MyDefrag, a free program that offers several levels of defrag. The reason I chose that is because Steve Gibson, of SpinRite and GRC recommended it in a show. If a guy like Steve uses it, I trust it. Absolutely. I have a copy lying around somewhere - I should run it again and see how it compares to Piriform's Defraggler (which I picked up based only on Piriform's reputation with CCleaner). After many years of trying many defrag util. I just decided on "Smart Defrag" (as did actionjksn) but as a separate defrag utilitity (w/o Advanced System Care suite) My reason was the "optimize" option. This option actually produces a somewhat noticeable improvement. Every little bit helps. But, does not that unnecessarily overwork the HDD if it has to here and there thousands of times?